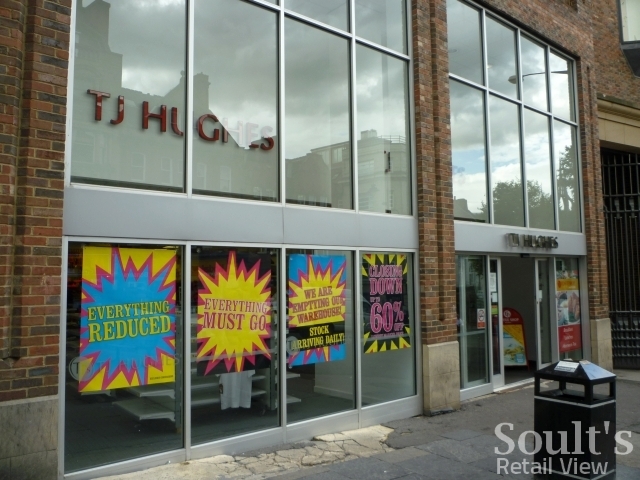 There was good news for Newcastle city centre earlier this week, with the announcement that the TJ Hughes store in Grainger Street had been sold, preventing the loss of 76 jobs. However, the collapsed department store chain’s Middlesbrough branch is one of eight that will close down for good by Thursday next week (18 August), leaving a large hole in the town’s Captain Cook Square shopping centre. 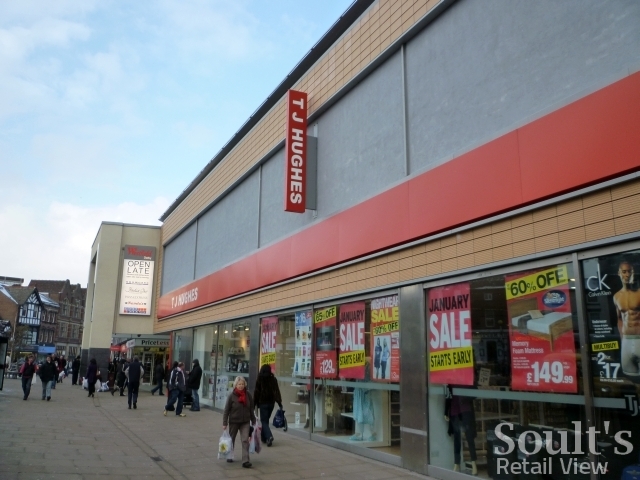 The Newcastle store and another in Widnes have been bought by Lewis’s Home Retail, a company owned by The Benross Group – a home and garden wholesaler that is already one of TJ Hughes’ major suppliers. The deal brings the total number of TJ’s sites acquired by Lewis’s to six, following the purchase of stores in Liverpool, Glasgow, Eastbourne and Sheffield – as well as the TJ Hughes brand – at the start of August. Lewis’s Home Retail acquired the rights to the iconic Lewis’s brand only last month, following the sale of assets owned by the collapsed Vergo Retail chain. However, Benross’ MD Anil Juneja has confirmed that the acquired stores will retain their existing TJ Hughes fascias with a view to building the chain back up again over time. 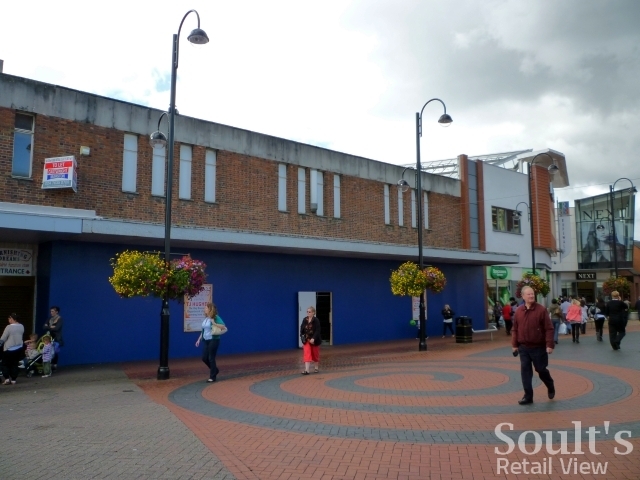 Lewis’s, meanwhile, is set to be revived separately, starting with a retail park store in Bury. The submitted plans for the ‘Lewis’s Home’ store suggest that while the relaunched chain will focus on homewares rather than a full department store offer, the familiar blue and white Lewis’s logo (below) is poised to make a comeback. 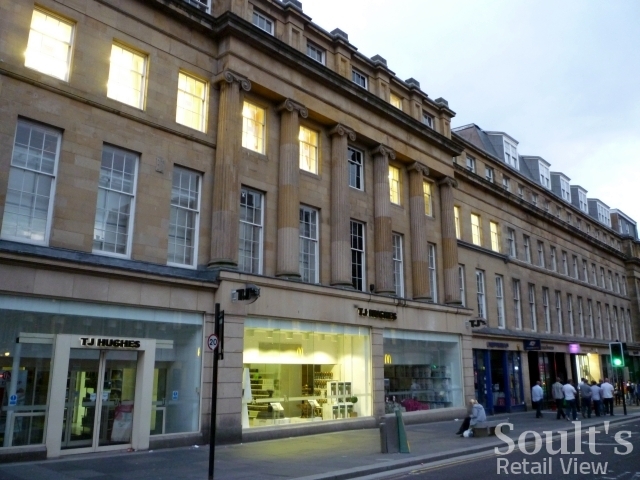 The sale of the Newcastle TJ Hughes store avoids the headache of a large empty unit in a slightly off-centre pitch within Newcastle city centre. Covering three floors and with a gross area of 91,000 sq ft (8,500 sqm), the unit is one of the city’s largest outside of Eldon Square and Northumberland Street, and its vacancy would most likely have seen the space being divided up. 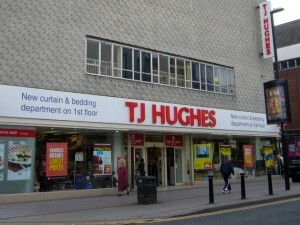 TJ Hughes has traded from the purpose-built unit since 2002, but the location is associated with two of Newcastle’s most well-loved department store names: Bainbridge (now John Lewis), which expanded across the site from 1838 to 1976 before relocating to Eldon Square; and Binns (House of Fraser), which occupied the site between 1977 and 1995. Most of the site was demolished and redeveloped following Binns’ departure, but apart from not having a frontage to Market Street, today’s TJ Hughes has a broadly similar footprint to its predecessor. 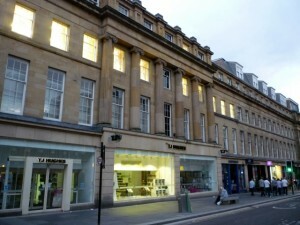 Interestingly, of the six TJ Hughes sites acquired by Lewis’s, three have a House of Fraser connection. As well as Newcastle, the stores in Sheffield and Eastbourne are both ex-House of Fraser sites that TJ Hughes acquired in 1997. 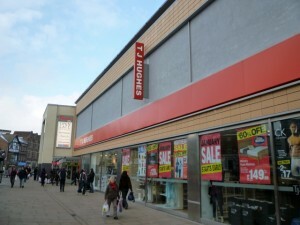 The Liverpool site is the original TJ Hughes flagship in London Road; Glasgow’s Trongate store is a former C&A; and the Widnes shop occupies a unit in the modern Green Oaks Shopping Centre. Indeed, over the years TJ Hughes has played an important role in mopping up large-format space that other retailers have left behind. Most recently, it has acquired a number of high-profile former Woolworths sites, including in Belfast, Derby, Hanley, Southend, Walsall and Nuneaton. 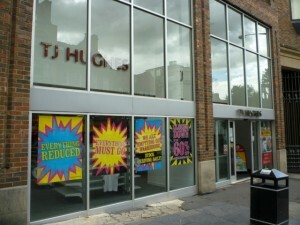 When I visited Nuneaton in August last year, work was underway to transform the town’s former Woolworths into a TJ Hughes; now, after less than ten months of trading, it will be closing this coming Sunday (14 August). In towns like Nuneaton – which already lost its Marks & Spencer store earlier this year – filling the former Woolworths site a second time may not be an easy task. 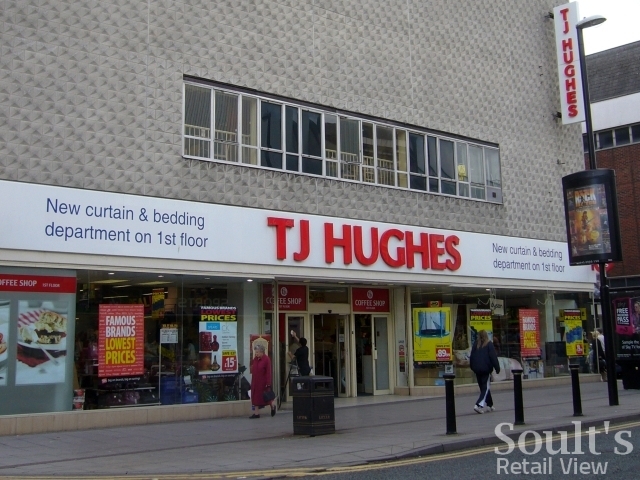 With six TJ Hughes stores saved, and 30 set to close over the next week, the future of the remaining 21 stores in the estate – including the Sunderland branch – is still in doubt. There’s a possibility that Benross may snap up one or two more, but its purchase of the TJ Hughes brand – ruling out any other retailers trading TJ’s stores under the existing fascia – suggests that there is little chance of more stores being acquired as going concerns. A more likely scenario is that retailers such as BHS, H&M, Wilkinson, Marks & Spencer, Primark and Debenhams will snap up the best sites once they become vacant. 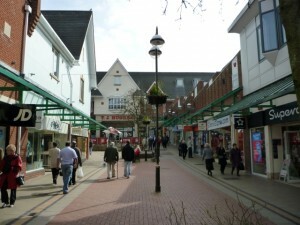 The site in upmarket Lichfield, for example, may appeal to the rapidly expanding Beales or to M&S, which already has a successful Simply Food store in the city. For both Middlesbrough and Sunderland, however, the challenge will be to find large retailers that aren’t already represented in those locations. Of the two, Middlesbrough is arguably the better unit, anchoring the modern Captain Cook Square shopping centre close to the prime Linthorpe Road thoroughfare; Sunderland’s, in High Street West, is in a fairly central location close to The Bridges shopping centre, but suffers from being an older, less attractive property that hasn’t been much improved since it housed a branch of Littlewoods. With both Middlesbrough and Sunderland already home to almost all the likely candidates – including BHS, H&M, Debenhams, M&S, TK Maxx, Primark, Wilkinson and Next – it will be interesting to see who else, if anyone, steps up to fill the gaps. That’s gonna be a massive branch of Poundland in Nuneaton. When TJ Hughes took the ex-Woolworths store over they opened up the first floor sales area – can now imagine it being sealed off again. Was in Walsall today and saw that the former TJ Hughes/Woolworths store is to reopen on Thursday as a new branch of Poundland. Pretty big compared to the current store in the towns Saddlers Centre. Although it looks like they’re not using the first floor as a sales area – from outside it looked like the escalator had been blocked off. Thanks Martin – I’d spotted an article about this at http://www.expressandstar.com/news/2011/10/17/500-join-rush-for-20-jobs-at-poundland/. Poundland is also taking the ex-TJs/Woolworths site in Nuneaton. Though I’m supportive of Poundland’s success, I think it is a pity when it takes over major units but only uses a fraction of the space. Scarborough, which I blogged about in the past, is the same scenario. Hmmm… with Focus style closing down notices. I’ve only managed one visit to the Nuneaton branch of TJ Hughes and with it being a large store anyway was surprised to see an upper floor sales area too. As you mention TJ’s was a welcome addition to Nuneaton following the loss of the towns M&S. I’ve popped into a couple of TJ’s over the past week, the long established branch in Lichfield – which I seem to think was the only TJ’s in this area for a long time – last Saturday which was packed with bargain hunters and the Walsall store yesterday.which was selling off the final remains of stock. There was a piece on BBC North West Tonight earlier about the Salford branch closing three days earlier than planned due to damage caused on Tuesday night’s riots.